Musings on Markets: Bitcoin Q & A: Bubble or Breakthrough? Both! Cult or Currency? Both! Bitcoin Q & A: Bubble or Breakthrough? Both! Cult or Currency? Both! As I have talked about or written on topics, I have learned that there are hot-button issues that almost always attract firestorms. Thus, when I write about Tesla, Apple or Facebook, I am guaranteed to provoke reactions, some strongly supportive and some strongly opposed, some rational and some emotional, but these reactions, for the most part, are determined by the pre-dispositions of the readers, rather than my views. In fact, my posting acts like a Rohrsbach test, with readers taking a portion of the post that is in line with or opposed to their positions, and either ignoring or discarding the rest of what I have to say. That, in part, is why I have stayed away from posting on Bitcoins, even as news stories about it, good and bad, have hit the headlines, since the world seems to be divided among the true believers in Bitcoins (who will brook no disagreement) and the cynics (who consider anything positive that is said about it to be a sign of gullibility). Since I live in a world filled with shades of grey, rather than black and white, I am going to try to look at the middle ground, though I undoubtedly will make neither side happy. Bitcoin is a currency! And it cannot be valued! Unlike an asset or a business which generates cash flows, a currency is a measurement unit that cannot be intrinsically valued. You cannot construct a DCF model to conclude that the US dollar is cheap or that the Chinese Yuan is expensive. However, it can be priced, at least relative to other currencies. With paper or fiat currencies, that pricing of course takes the form of exchange rates and the question about a paper currency's pricing becomes one of determining whether the prevailing exchange rate is a fair one. However, not all currencies are paper and some non-paper currencies have been in use for centuries. The most obvious of these non-fiat currencies is gold and in a prior post, I argued that gold cannot be valued but that it can be priced, relative to paper currencies and that the pricing can be traced to fundamentals. Using the same logic, I will argue that while it is impossible to value Bitcoin, it is possible to view its price as an exchange rate into paper currencies and make judgments about whether the pricing is fair, again on a relative basis. To make judgments on both the efficacy of Bitcoin as a currency, and indirectly, its staying power and pricing, I looked at three determinants of a currency's price/power: the trust you have in its issuing entity, its acceptance in transactions and how securely you can store and save it, while generating a fair rate of return while doing so. The first factor that determines a currency's price is the trust that users of the currency have in the issuing authority to keep its supply in check, with greater trust going with greater willingness to use and hold on to that currency. With paper currencies issued by governments, the authorities are usually the central banks in question: the Federal Reserve for the US dollar, the European Central Bank (ECB) for the Euro and so on. With gold or physical currencies, the constraint is usually a physical one, insofar as the supply of these physical currencies is limited by nature. Since anything that releases that physical constraint will render that physical asset useless as currency, it is ironic that alchemists have, for centuries, tried to make gold in laboratories, because their success would have undermined the use of gold as a currency. So, what is the issuing authority for Bitcoin? There is none! While that may seem like a fatal weakness, the innovative aspect of Bitcoin is that while the power is spread across the network of users of the currency, the supply is set by a computer algorithm, which, in turn, cannot be changed by any user or even a group of users. If this sounds too complex, and it was for me, you may want to go back to the source, which is the paper that gave birth to the idea (by Satoshi Nakamoto). If the name sounds familiar, it is because it is back in the news again, with the controversial story in Newsweek last week, claiming to have unmasked the real Satoshi Nakamoto, with that person claiming in response that he was not the inventor of the Bitcoin. I must confess that the technicalities in the paper went over my head and I found this YouTube description of how it works to be a good one, though it is from the perspective of someone who is a Bitcoin believer. 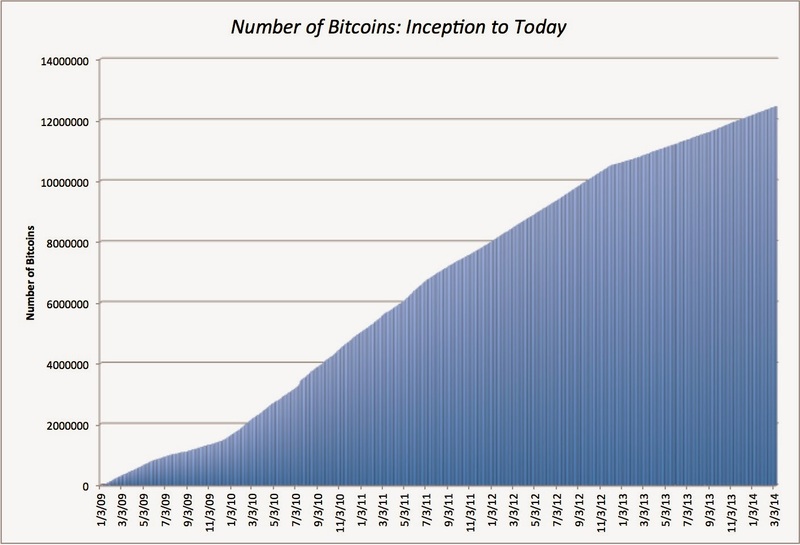 There were 12.4 million bitcoins in circulation in March 2014 and that number will rise, on the preset path, to reach a cap of 21 million bitcoins in 2140. The way in which people can acquire one of the new bitcoins is by mining for them, running powerful computers, as described in this article in the New York Times. As more and more people try to mine for these bitcoins, though, the difficulty of finding bitcoins has become greater over time. (a) Do you trust central bankers? (b) If so, do you trust some central bankers more than others? 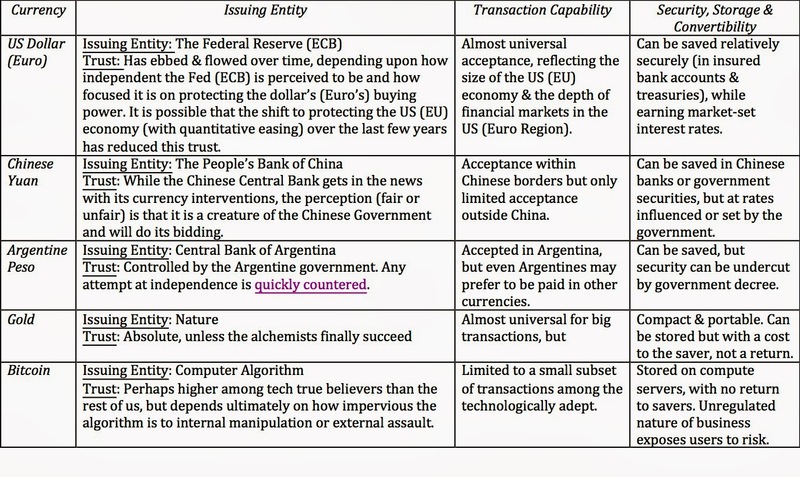 (c) Are these some computer algorithms that you would trust more than some central bankers? My answers to these questions would be (a) not really, (b) of course and (c) yes. The rise of Bitcoin in the last four years has coincided with the Age of Hubris in central banking, where central bankers have donned Supermen capes and viewed their mission as saving economies, rather than protecting their currencies. It is also worth speculating whether money that would have normally flowed to gold, historically the prime beneficiary of loss of trust in central banks, has flowed instead into Bitcoin, explaining both the anemic price behavior of the former and the heady price action in the latter. Bitcoin's staying power will ultimately depend upon how impervious its source algorithm is to mischief. While Bitcoin's defenders are quick to argue that its computer fortress is impossible to breach, this article seems to suggest that there are potential flaws that may be exploited by a collusive group. I am an absolute novice when it comes to computer technology of this type and I don't know how much weight to attach to the claims in the article, but if you are a Bitcoin promoter, you want to make sure that even the slightest doubts that the algorithm can be fudged or modified are dealt with quickly and openly, since those doubts will undo its effectiveness as a currency. 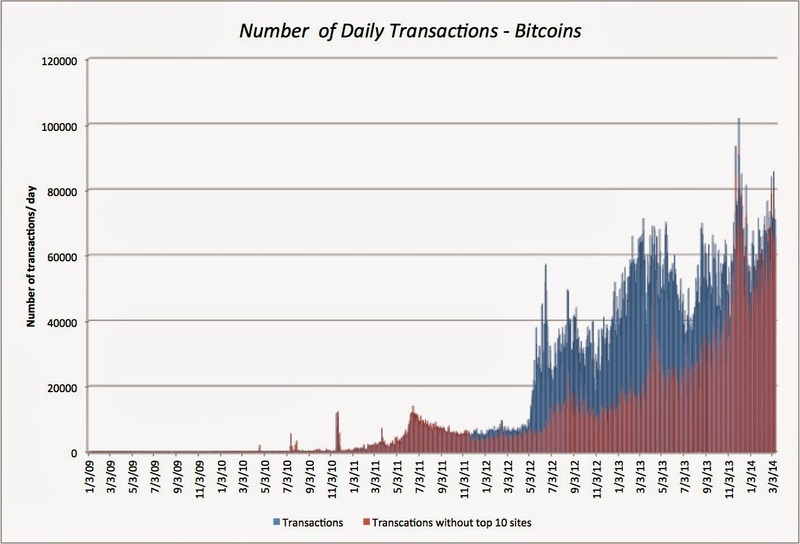 Clearly, there are more Bitcoin transactions now, than ever before. Having never used Bitcoins in transactions, I was curious about how it worked and this link was pretty useful to get started, as I proceeded to build my bitcoin identity. I first created a digital wallet on my computer, which generated my first and subsequent bitcoin addresses. I then went to coinbase, one of many vendors of Bitcoins, to acquire my first Bitcoin, and after realizing that it would cost me $640, decided to check on where I would spend that Bitcoin by visiting this site that lists vendors that accept bitcoins in transactions. The good news is that transacting with Bitcoins is a breeze: you create an address for the transaction that you swap with a vendor who accepts it, and it is recorded in a transaction log called a block chain. The bad news is that vendor list is still limited, even in the US, and non-existent in many other parts of the world. In summary, Bitcoin is a currency, but one that is currently accepted only in a small subset of transactions and used by only a few. Whether it or any other digital currency will be widely accepted will depend in large part on how its advocates package and market it. If the emphasis is on convenience, low cost and transaction speed, it has the potential for much wider acceptance, especially if it is made simpler to understand and not oversold. If the focus is on privacy, security and anonymity, I am afraid that the dark side will win out and it will become the currency of the paranoid and illegal, with all of the associated costs and benefits. The final measure of a currency's strength and durability is how easily you can convert it into other currencies, how securely you can store and save it and and whether you are compensated while you hold it. The global currencies of trading, such as the US dollar or Euro, offer these benefits, since they can be converted at minimal cost into other currencies and can be invested in banks or securities to generate a market-determined rate of return, while idle. Emerging market currencies are more constrained, sometimes because they are restrictions on conversion into other currencies and often because they cannot be used or invested outside their local economies. Gold offers an interesting anomaly. While it can be converted into other currencies in most parts of the world, there are restrictions on trading gold in some countries, and holding gold does not offer any explicit returns other than potential price appreciation. You can save your bitcoins on computers, but can you do so securely? It is possible that the stories about bitcoins being stolen from supposedly secure servers are overblown and that the recent collapse of Mt. Gox (one of Bitcoin's biggest exchanges) was an aberration, but it seems to me that if these servers/exchanges are the equivalent of banks in the Bitcoin economy, these banks are unregulated and depositors have neither protection nor insurance against either bank runs or bank robberies. While it may conflict with the vision of some Bitcoin revolutionaries, the Bitcoin economy may need a banking system of its own that is regulated and perhaps even insured by a centralized entity. To get a measure of Bitcoin as a currency, I decided to do a comparison with three paper currencies (the US $, the Chinese Yuan and the Argentine Peso), a real currency (gold) and a digital currency (Bitcoin). Note that these are my subjective judgments and that you should free to substitute your own to come to your own conclusions. So, what do I get out of this table? Given my perceptions of how these currencies measure up on three three dimensions of currency quality, I would choose to be paid in US dollars over being paid in Chinese Yuan, and in Chinese Yan over Argentine Pesos. While I trust Nature more than any central bank when it comes to self-restraint, the lack of market-determined returns from holding gold would tilt me towards holding US dollars over holding Gold, but it is a closer call than it was five years ago. I would rather be paid in gold than in Yuan, though I would still be more comfortable with Yuan than Bitcoins. Finally, and I apologize in advance to my Argentine friends if they are insulted by this statement, but I am afraid that I would rather be paid in Bitcoins than Argentine Pesos today. Bitcoin: To Buy or Not to Buy? Now, for the $640 question! Would I buy Bitcoin at today's price? No, and not because I am a Luddite that is convinced that digital currencies will not work. It is because I have never been good at calling currency movements and consequently have never bet on them. Since I would not bet on the dollar strengthening relative to the Euro or on the future price of gold, why would I try to do so with Bitcoin? I believe that there will be a digital currency in wide use a decade or two from now. The question, of course, is whether that digital currency will be Bitcoin or a competitor. If you are a Bitcoin enthusiast, the pathway to its success requires three developments: the computer algorithm underlying the currency has to stay transparent, robust and protected, the usage of Bitcoins has to spread beyond the narrow band of enthusiasts to the broader marketplace and the infrastructure for securing, transporting and saving Bitcoins has to be strengthened. That will require true believers to accept compromises to both their vision (of a truly decentralized currency with no regulatory authorities or power) and their practices (anonymity, for instance, might become a casualty to commerce). Anarchy is a great disruptor of the status quo, but long-lasting currencies require order and predictability, and Bitcoin's biggest promoters seem to have little fondness for either. I was unaware with the fact that Bitcoin is a currency, but one that is currently accepted only in a small subset of transactions and used by only a few. I was a skeptic right from the first time I heard about it because the fundamentals didn't look right at all. I have had long discussion with one of the earliest miners of Bitcoin but even he couldn't provide me the fundamental logic as to why Bitcoin should have any value at all. Thanks for making things clearer with concrete logic. I'm obsessed with Bitcoin. I've been following it closely for about a year. This post is fair. Bitcoin has both positives and negatives. It is a huge gamble. I like it because it lets me control my own money. I can hold on to my own coin and no bank can take it through fees or bail ins. On the other hand there are a number of reasons to give someone else control over your bitcoin. If you want to exchange bitcoin for fiat you have to send money to a centralized exchange. Some people send their coins to web wallets for convenience. Giving control of your bitcoins to someone else is far riskier than giving fiat to a bank, because of the unregulated, uninsured nature of Bitcoin institutions. Using intermediaries, like Bitpay, Gyft and snapCard, bitcoin is easy to spend, even with merchants that don't themselves accept bitcoin. Bitcoin is harder to obtain than it is to spend. Bitcoin right now is the wild west. I, personally, have high hopes for it, but I wouldn't recommend grandma putting her retirement into it. I was hoping this post would go into convertibility in more depth. My impression is that the transaction costs in a roundtrip transaction from dollars into bitcoins back into dollars would be enormous, and it could involve significant delays as well -- but it's hard to find clear, impartial information about this. Aswath, I would note that Bitcoin can readily be stored securely offline (e.g. on paper in your safe, https://en.bitcoin.it/wiki/Paper_wallet) without any computer involvement until you need to transact. Hence this can be as secure (or not) as gold. (In fact you can make backup paper copies too should you wish.) The same cryptographic mechanisms protect you either way. The transactions costs are not large. This is a relatively liquid market, at least at the moment. That is one reason I would prefer Bitcoins to many emerging market currencies. Thank you for making the point about how you can store it. I am not an expert but I think is Amos is right in noting in that there is a trade off between security and ease of use/convertibility (by sending your money to an exchange). Prof, An interesting discussion however you have neglected to address one of the fundamental characteristics of a currency as Buffet and Paul Krugman,Nouriel Roubini and many leading economists/investors point out regarding bitcoin..it is not a reasonably stable store of value! and is therefore not a currency. I note countries such as Japan,norway and Canada have already stated bitcoin is not recognised (by them) as 'currency' and that feeds into the above point. bitcoins in the Bitcoin protocol actually could have some value, although it's pretty irrelevant as bitcoins are traded way beyond this value. For example, Gold has a value because it's used for industrial purposes, but gold trades way above that value. Bitcoins are essentially timestamped, programmable slots in a ledger. That means you can send a bitcoin transaction and sign it with a hash of some message, like a contract. This could prove the document in its exact form existed at that particular time. Timestamp services have value, and thus bitcoins can have value. A bitcoin can be split in 100 million pieces ('satoshis'), which each could be a timestamp. There's many more such applications which of timestamped programmable slots in a public ledger which, when priced into a company offering those services, could give a DCF valuation of an individual bitcoin or satoshi. That is Buffett's definition and it is not mine. A currency, to me, is a medium of exchange. Buffett at least is internally consistent and feels that gold should have no value either. On the question of store of value, what exactly does that mean? That you earn a positive real interest rate for saving your wealth in that currency. If so, is the US dollar currently a store of value? There are many savers who would argue that real interest rates are now negative, especially if you are liquid and short term, and that you are destroying value by holding dollars, not storing them. As for Krugman, Roubini et al, I believe in thinking for myself. I believe that Bitcoin is a currency, but not one that is secure or even guaranteed to survive as a currency in the future. So what? I could say the same thing about a lot of fiat currencies as well. I agree with everything being said here, but one thing that got overlooked is the supply demand dynamic which is critical in pricing a cult currency such as bitcoin. If the number of bitcoins are expected to at most double in the next 100+ years, then there would be a definite supply demand mismatch assuming that the currency can sustain its relevance. Added to this, not all bitcoins will survive, further reducing its overall supply ... for example check this article on CNN according to which a gentleman lost his 7500 bitcoins due to a simple mistake. This supply constraint can act both ways .. it might for instance make the currency too expensive to be used in day to day transactions and hence making it irrelevant. It might also elevate bitcoin to zen like status among young millionaires and make it a cool thing to acquire and hold on to. Many thanks for this interesting post. I am wondering for how long bitcoin can remain unregulated. At one point in time, it will simply become too big to remain unregulated. Users will want some form of security when using the currency. Prof, all of your comments are fair. However, I do feel that for use of bitcoin in a transaction and to store it (electronic or otherwise) you need to have enormous trust in the computer program. Alas! only a fraction of the population seem to (not for sure though) understand the algorithm and have faith in that system (program). When this is the case, how come you and I (we don't understand the mechanics, hence no faith) could use this as a currency? If a few people (feign?) transact in bitcoin does it mean that it becomes a currency? To make it a currency it has to be widely used for transaction purposes. As of now, it is not so; therefore, as of now it is not a currency. As for future, bitcoin appears to be a fool's game (gamble) since no one knows what holds in future. A lot of folks are going to get burned really bad by bitcoin. The IRS just ruled that bit coin is like a security like stocks and bonds and will be subject to tax. Bitcoin to Bank Account, Bitcoin to Bank wire, Bitcoin Cashout, Bitcoin to Bank transfer Buy sell Bitcoin, Exchange Bitcoin, transfer bitcoin to bank account, selling bitcoin, Bitcoin to international bank. I never heard about this new currency Biticon though some people not treated this as currency and I had got many facts after reading your post. A very new thing came to know . Thanks for sharing here. Thanks a lot for a awesome presentation on Computer Repairing service! Yes i am agree with your content. Some days ago i gotten a amazing sites with a lot of tips to repair Computer. There was also many online It Support! I think bitcoin is amazing, a currency that is not controlled by someone in particular is a great thing. I see more and more webstores accepting bitcoin and there are even sites where you can play games with bitcoins and I love it. We have teamed up with a select group of Private companies and investors to offer 100% principal investment insurance for all of our investors. This group has agreed to insure all principal deposits for a share of our monthly earnings. This allows our group to diversify their investment portfolio and create a risk free, highly attractive, and profitable investment opportunity for our investors. Guys, trade your Bitcoin for OlympicCoin (OLY) on Mintpal, it is so cheap right now. OLY only has 58million coins in total and you can buy 1million of them right now for less than 1BTC... that means in a few weeks the 1million will be easily worth 10BTC! OLY developers are working on new projects - that's all you need to know. REPOST to spread the word. Time for us all to get rich! Earn free bitcoins every hour - no limit. Guaranteed payout every Sunday. NO minimums necessary. Faster than mining for coins. If you try this and it works for you, please comment that it works. i am interested in www.virtex.com. A new platform that is launching this month and offering great deals. Sending Money to India Just Got Awesome!. An easy way to compare the exchange rate offered by various banks and get the best exchange rate when sending money to India. "The Economist finds it intriguing while GigaOM's Matthew Ingram points out several problems with it. Service of the Bitcoin atm card is really great. This site is very conscious about the security of the clients and they give full support if you are facing any problem for handling Bitcoin atm card. This card is going to be as like as your friend. Thanks for sharing a helpful post. I want to shear some with all Bitcoin user. You can now collect your Bitcoin ATM Card . Just visit this site and get your all information. Thanks to all and enjoy your payment method.